Quaint and Quirky: Super simple baby dress - or "Make it Work"
Super simple baby dress - or "Make it Work"
I had given it a regular hem on the bottom though - not a ribbon hem as was shown. When I tried it on Amelia, I found that it fit her torso and the length was fine. I used the same fabric to cut out two 3.5 inch wide by ??? inches long (I just overestimated) strips of fabric. I sewed long ends together to form a tube, turned them inside out and pressed it with the seam in the center back. I tried the dress on again, used safety pins to determine where the straps should go on the front and the back and sewed them onto the dress (I finished the ends of the straps with my serger, but you could just turn the raw edge in and sew it closed on both ends). Note: I left a significant tail in the back for the straps so that I can reuse this dress as a shirt next year and lengthen the straps as needed. 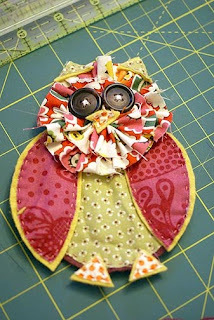 I had this owl from a scraps tutorial I had previously done, so I topstitched it in place. Tutorial here: Scrap embellishment tutorial . What's the point of this blog post? Make it work. Not every project has to be perfectly laid out, planned, and executed. Sometimes it's fun to work with what you have and improvise. Try it. It's freeing! I hope you all have a great Thanksgiving! I'll be back to show you a fun Christmas present wrapping idea I had! I love the owl...and I am with you on the Sunday thing....I am always making some sort of something before church. 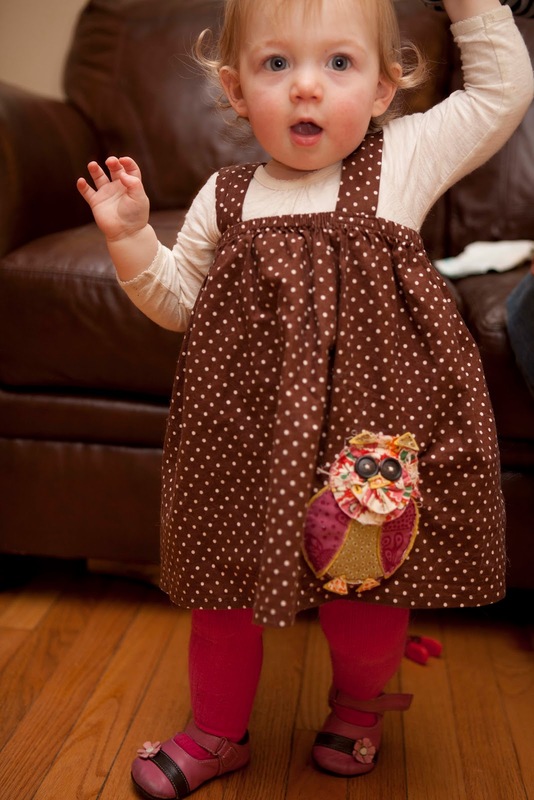 Darling dress!